...but, did I really laugh out loud at it? Hmmmm. What was funny about that? It didn't make any sense either. Randi is not a philosopher. He does not ask questions. He asserts things. This cartoon is inaccurate. I really feel sorry for you scecop. 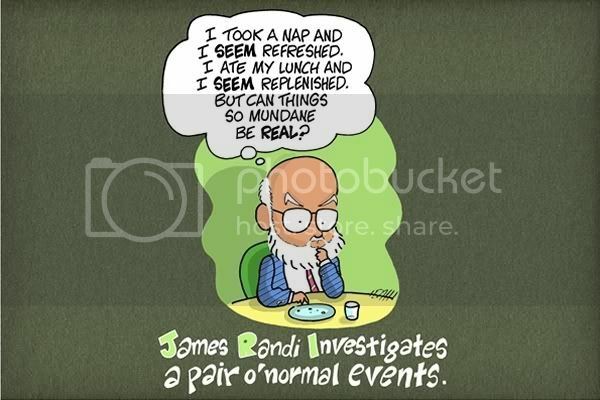 . . especially when the humor stems from an "anti-Randi" point of view. Scepcop wrote: What was funny about that? It didn't make any sense either. Randi is not a philosopher. He does not ask questions. He asserts things. This cartoon is inaccurate. C'mon scepcop, an anti-Randite such as yourself should recognize this as a satirical spoof. I'm sorry justintime, but I have no idea what your post means. The "randi's dilema" in the OP of this thread referred to the cartoon posted. i have no idea what dilema you are referring to in your post or what your comments about that nemerology thread has to do with anything or why you're having a conversation about a JREF thread over here. justintime wrote: Sorry I saw a thread not going anywhere and figured I would post a real dilemma his site is facing. Oh. Well, just so you know, Randi's forum is separate from Randi himself. I don't know if Randi ever posts on the forum, but I wouldn't consider any issue debated in the JREF forum to be Randi's personal issues.